The first quarter of 2017 is complete and March went out like a lion as far as earning dividend income. Traditionally March, June, September, and December are always big months for earning dividend income for our portfolio. That is because over half the stocks we own pay a quarterly dividend falling on these months. While most of our focus is building and reporting our annual dividend income numbers, months like these are fun to talk about too. Each little milestone gives us more motivation to continue growing our portfolio of dividend stocks. Oh Yeah! We set a new all time high record in March for dividend income. 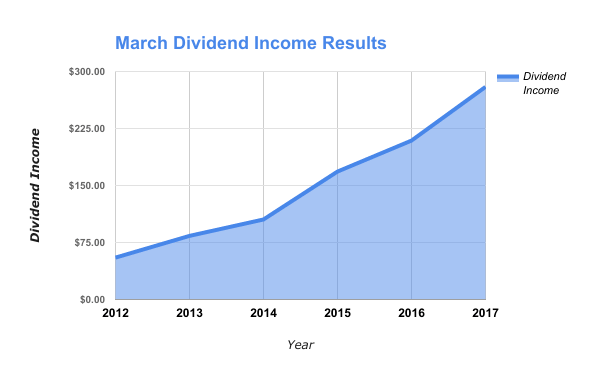 March has always been a very good month for earning dividend income (see below). So it is not a huge surprise that we passed our previous high set back in September 2016. Since we are constantly investing new money and reinvesting our dividends … our income stream should continue to grow every single month. And that is what we saw last month … all those dollars hard at work earning more dollars. During March, we continued to grow our new investments as well as our most recent dividend income earnings. We saw an increase of 33.8% last month compared to March 2016! That is awesome growth for this portfolio. Overall, we had 16 stocks pay out a dividend in March. This was the largest dividend income amount we have every received in one month! Awesome companies like Aflac, Johnson & Johnson, McDonald’s, Microsoft, and Exxon Mobil gave our family a paycheck for not really doing much at all. How great is that? The start of 2017 wasn’t the best for new investments. Both January and February, we fell well short of our new investment goals. And while we didn’t hit our target in March either (around ~$1,400), it was a step in the right direction. 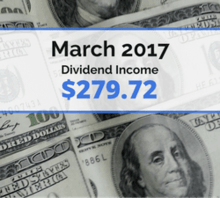 The dividend income earned in March ($279.72) was up over 33% from the same time last year and set a new record high for a month. These increases were from a combination of new investments made, dividend reinvestment’s, and company dividend increases. Speaking on company dividend increases – we got a few this past month – Realty Income Corp (O) 0.24%, Best Buy (BBY) 21.4%, and Genuine Parts Company (GPC) 2.7%. We have earned a total of $556.14 in dividends for 2017 … which means we need to earn around $1,840 the remainder of the year. That is an average of $205 per month. Full Disclosure – At the time of this writing, we owned shares in the following stocks noted in this post – ADM, AFL, AAPL, BBY, CINF, CSCO, DPS, ED, EMR, INTC, JNJ, K, KHC, MCD, MSFT, NSC, O, TGT, UL, VFC, and XOM. The material above is not a recommendation to buy. Please do your own research on a company before deciding to invest.